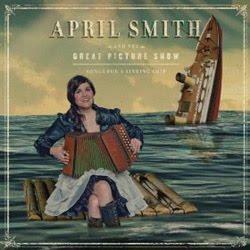 Not many people have heard of April Smith, but I’ve become quite the enthusiastic fan. Her music combines elements of pop and rock, but her voice has more of a jazz quality that gives the end result a great mix and unique style. I loved her previous album, loveletterbombs, and I saw Smith perform live a couple of times, so when I heard she was raising money for a new album through Kickstarter, I signed right up to contribute. But then she posted the track listing for Songs for a Sinking Ship, and I already knew half the songs. Needless to say, I felt a bit let down. Sure, some were from her live EP, and I expected them to show up again, but one went as far back as her 2005 album! I kept an open mind and eagerly hit play when I finally got my copy. Halfway through the album I was already swallowing all of my doubtful words. From the first song, “Movie Loves a Screen” (my favorite of the new tracks), the energy and style wakes you up and makes you pay attention. She sustains this throughout the album, even on the slower tracks that draw you in with her emotional words. The pleasant surprise was that tracks I already knew were mostly different, better versions of what I’ve heard before. By the time I got to the last track, I was sorry the album was finished and immediately started listening to it all over again. What really impressed me was the song “The One That Got Away.” This ballad from loveletterbombs was one of the songs that made me a fan in the first place. The song has gotten a complete makeover for this album, and now I can’t decide which version is my favorite. The tempo is sped up, the minimal instrumentation is replaced with a carnival feel, and what once sounded like a brokenhearted plea now sounds like an embrace of her circumstances. I have complete confidence that if she re-released a new version of loveletterbombs, I’d pre-order that too. For people who aren’t already fans, it’s hard to listen to April Smith without finding a song that piques your interest and makes you curious to hear more. But even somebody who already owns her other albums won’t feel let down by spending the money to get this one. This is one of the best albums I’ve heard in a long time, and I can hardly wait for the next one.